The purpose of this study was to compare the effects of nonelastic adhesive tape, dynamic bracing, and no-tape/brace on static and dynamic balance during single-leg stance in women’s college volleyball. 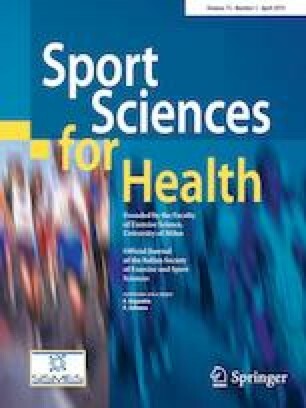 Seventeen young uninjured players (18.94 ± 2.49 years; 1.71 ± 0.05 m; 65.45 ± 9.49 kg; 9.2 ± 4.1 years played; 4 ± 1 weekly training frequency) were submitted to three conditions presented in randomized order: dynamic bracing; nonelastic adhesive tape and no-tape/brace. In all conditions, the center of gravity displacement (total displacement, TD; anteroposterior displacement, APD and mediolateral displacement, MLD) of the dominant and non-dominant lower limb (DLL and NDLL) was assessed using the static and dynamic platform of the Biodex Balance System. The ANOVA (three-way) test with repeated measures was applied, considering a 5% significance level. The results showed no interaction between any of the independent factors in all displacements (p > 0.05). However, there was a significant main level effect for TD (p = 0.001, mean difference = 1.1°) and MLD (p = 0.013, mean difference = 0.30°), with greater displacement in the dynamic level compared to its static counterpart. There was also a significant main limb effect for APD (p = 0.003, mean difference = 0.73°) and MLD (p ≤ 0.001, mean difference = 0.60°), with a higher degree of instability in MND when compared to MD. In conclusion, the data indicated that the use of nonelastic tape and bracing was not superior to the no-tape/brace condition in controlling center of gravity displacement during single-leg stance. All authors contributed to the conception and design of this study. G. M. Barbosa wrote the article drafts. W. H. Brito Vieira and H. H. Santos critically revised the writing and data interpretations. All the authors approved the final version. This work was financially supported by the Brazilian National Council for Scientific and Technological Development (CNPq—2010 grant call). All procedures involving human participants were in accordance with the ethical standards of the institutional and/or national research committee and with the 1964 Declaration of Helsinki and its later amendments or comparable ethical standards.